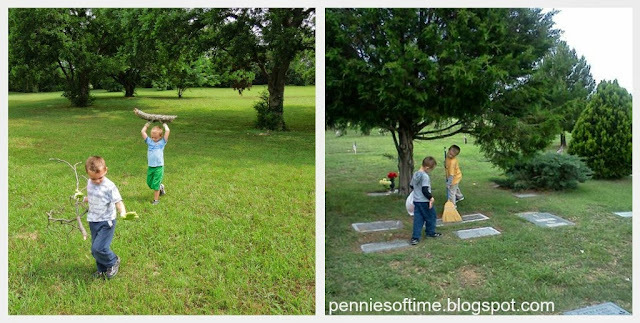 This is a guest post by Sheila of Pennies of Time. “Oh, NO! I didn’t get it!” Big Brother’s face is all frowns and disappointment. The boys are in the middle of a game of Superhero Memory. It is Little Brother’s turn next; he knows where the matching card is that his brother missed. We expect him to go in for the match. “Hey, just try it again. I know you can do it!” Little Brother passes up the chance for a match and gives Big Brother a chance to have an extra turn. Big Brother tries again, finds the match, and reaches over to hug his brother with all grins and completely happy. Our family has recently finished a year of serving others each day. We do small, simple things with the goal of spending 15-20 minutes each day on helping others. When we started this journey, Little Brother was 3 years old. 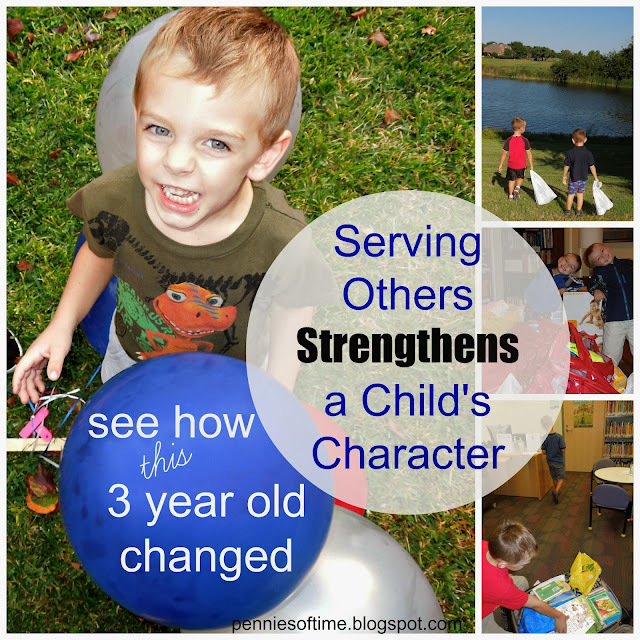 I want to share with you how this year of serving has changed him, strengthened his character. Little Brother is a rambunctious and active four year old. He loves to be silly, accessorize his outfits, and meet every puppy that passes his path. He is a mover and a shaker, ready for adventure, and always up for an impromptu dance party. A year ago, as a 3 year old, Little Brother was a typical self-centered 3 year old. He could be overly aggressive with others, fearing that if someone took something or played with something, that he might not get his own chance. He might hit instead of using words or other skills to remedy a conflict. He would want to help when others were cleaning but needed simple directions to know what to do. Little Brother, as a 3 year old, was more immature than his peers in expressing himself, in understanding others, and accurately interpreting other’s actions. Over the past year, we served every day. We brought in neighbors’ trashcans, cleaned grave sites, cleared brush at a group home for adults that are disabled, mailed care packages, wrote letters to soldiers, and many other simple things to help someone out. One of Little Brother’s favorite activities was cleaning out the creek near our elementary school. Little Brother is happier. He is no longer self-focused. He works so hard to help others and is better at recognizing what is needed to be done without asking or being told what to do. He voluntarily gives up his own possessions to bring a smile to someone else. He knows how to work hard. He will go above and beyond in helping a neighbor with yard work. A year of growth will naturally bring maturity. It is my strong belief, though, that the increased level of maturation and empathy shown by Little Brother is more than typically gained in a year, and it is due to our continued focus in teaching our boys to serve others. Little Brother will stand at a door to the gym or a restaurant for 10 minutes focused on making sure he holds it open for others. Last weekend, another child gave him a chance to play with a bubble machine. 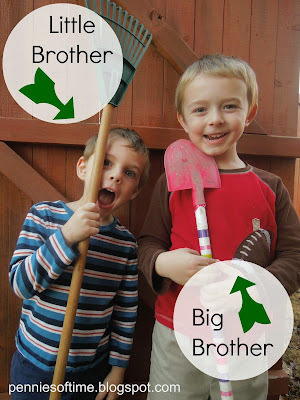 Big Brother indicated that he wanted to use it, too. After playing with it for 10 seconds, Little Brother handed it off eager to let his big brother play with it. When the boys are sharing a drink, he will push the drink towards his brother until he needs a sip and then immediately moves it back within his brother’s reach. Acts of service do not have to take a long time to have a lasting effect. Sheila began her career in education by working with children and continues to serve as an advocate for children that are at-risk. She has taught in a variety of settings from a classroom in small town Texas to a psychiatric unit in Chicago. 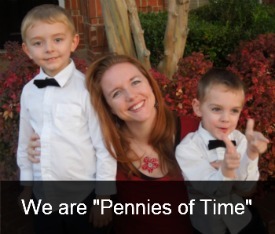 She is the mother of two young boys and is the voice of Pennies of Time where she shares the adventures of serving with her two young boys. You can see more of what they do on Facebook, Twitter, and Pinterest. What an amazing project!!!! And so so inspirational. I really enjoyed reading about the changes in your little one’s character. Thank you, Varya! I thought that doing this with my boys would be a good idea. Turns out that serving with my boys has been the best thing to happen to our family. What an inspiring story! And it just goes to show that helping others also helps us too! You hit it spot on, Kate! I couldn’t agree more! That’s so beautiful! It’s wonderful to see positive parenting in action, and you have the good results to show for it! Thank you, Angelina! Enjoyed reading your blog–Love reading the wisdom and experiences of others. This was so lovely to read. I just adore how you bring up your boys. I think including serving others within your child’s learning can only do good. You are totally right, Penny! It has been a great experience for us. Thanks for your comment! This is a gorgeous post, so very inspiring. I hope to do similar with my littlies. I love the real and meaningful changes that it made! Thank you! We feel we have benefited so much more than the people we have helped. Really has bonded us together even stronger than we were before we started this. Thank you, Debs! Please let me know how it goes for your family! Bek-I read your first comment and agreed completely about Chelsea doing a great job teaching her boys. 🙂 We are gaining so much by helping others! Thanks for your comment! Thanks, Pauline! I enjoy your site! Thank you, Kate! He is a fun boy. Thanks for commenting! What a sweet story. I was almost expecting to read that Big Brother did the encouraging. I also love the gratitude that Big Brother showed. What a lovely relationship your two boys have. Thank you! And, I am in LOVE with your site. So glad you commented so that I could find it!